Designated event overseers have some additional functionality available to them in the My Events section of My ChurchSuite for those events that they oversee. 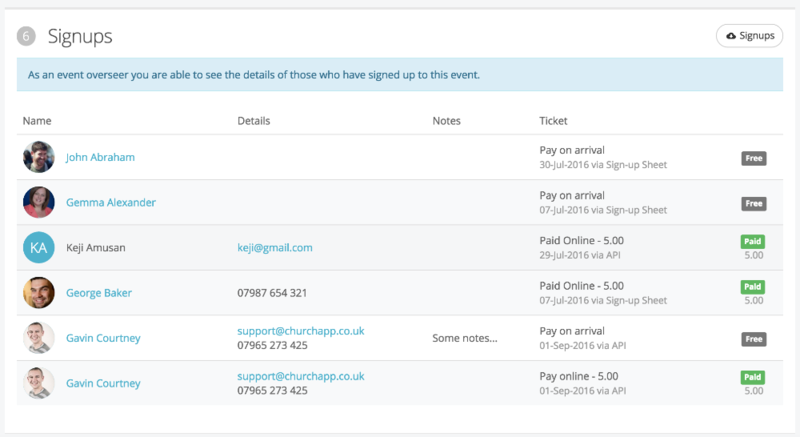 By way of reminder, one or more overseers can be designated for each of your events from within ChurchSuite's admin-facing system - this is done as part of creating an event, adding it to your Calendar module. Then, as long as your event overseers have access to My ChurchSuite (the member-facing side of ChurchSuite), they are able to view the list of people who have signed up for the event. As the above screenshot demonstrates, clicking into an event displays a list of the event sign-ups, any notes they added to the signup and details of their tickets and payments. The list includes free and pay tickets and includes all sign-ups; both those who sign-up via a website online, those who sign-up via My ChurchSuite, and those who are manually added by a User via the event's page in your ChurchSuite Calendar module. 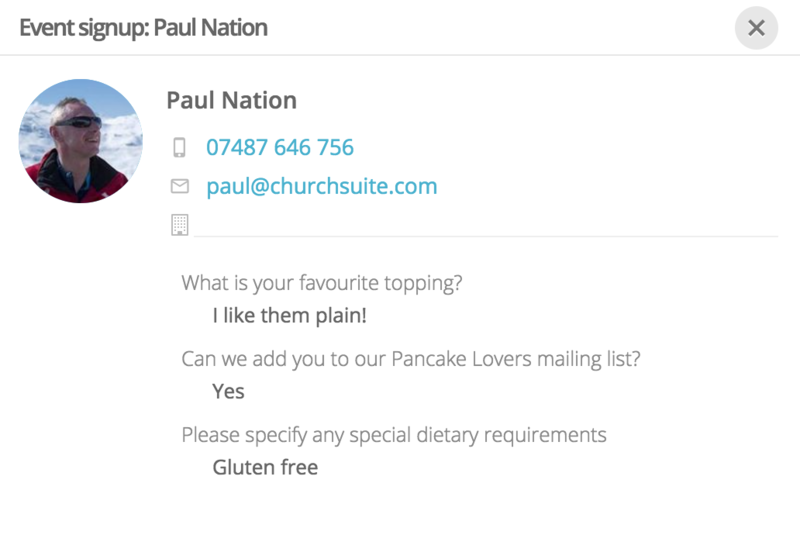 Clicking on a sign-up will open a pop-up window showing the sign-up's contact details and any sign-up question responses. At the top of the sign-up list is a "Signups" button that allows overseers to download the list of sign-ups (contact details, ticket information and event question responses) to a CSV file. Note that it is not currently possible to communicate with event invitees or sign-ups from within My ChurchSuite - that functionality can only be done from within your admin-facing system by a user.